WHFB - Another game in the club competition: Aaron's Wood Elves took on Grant's Vampires. DBMM 25mm - Rob played his first ancients game for several years borrowing Andrew's Han Chinese army, and beat Andrew who was using Early Crusaders. 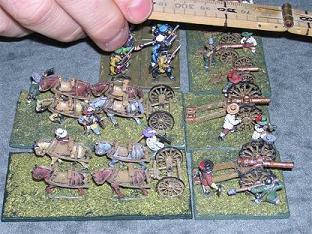 Shattered Lances 25mm - Brendan and Grant had a game using 14th Century Spanish and English armies. A win to Grant using the English. DBR 15mm - Ian has returned to the club from his world travels! Today he had a DBR game with Stu. Stu's 30YW French defeated Ian's German Catholic army. Well that's it for this year at the club. We take a break now and meetings resume on Sunday 8 January next year. Best wishes to everyone for the holidays! WHFB - First games of the club competition: Aaron the Senior's Empire had a winning draw against Brett's Orcs and Goblins, and Rob the Senior beat Russell. In a non-competition game, Dan beat Aaron the Junior. DBMM 25mm - One more competition game, Philip (Kushite) beat Kendall (Hussite). In another non-competition battle of the plastic armies, Lee's Macedonians beat Andrew's Early Crusaders. Crossfire - Kit and Pete had a 15mm WWII game using the Crossfire rules. Flames of War - Kendall's US Armor smote Garth's Fallschirmjaeger 5-2 in a Late War free for all. Damn Battleships Again - Stuart and Brett had a game of Damn Battleships Again. Stuart's American battleships slaughtered the Spanish cruisers fleet in an action off Cuba. Two surviving damaged Spanish cruisers escaped the debacle, while the lone Spanish battleship held the Yankees off. Congratulations to Kit for winning First Place in the 1st Official Grand New Zealand Tournament for Flames of War which was held this weekend. The NSWC was represented by Rob (Germans), Brett (Russians), and Kit (Gurkha Rifles). The competition had five different mid-war scenarios (Meeting Engagement/Death from Above; Hold the Line/Big Push; Breakthrough; Fighting Withdrawal; and Free for All) and a painting competition. The tourney was in a very nice venue, the Mount Eden War Memorial Hall. All the tables had sculpted terrain, featuring a lot of No Man's Land buildings and accessories. Just a couple of games at the club today. WHFB - There was a 7000 point battle. On one side was Rob and Dan with Vampire Counts, and on the other side Russell and Aaron with Brettonians. DBMM 25mm - An ancient competition game between Philip (Kushite Egyptian) and Lee (Alexandrian Macedonian). An 8-2 win to the Egyptians under the old DBM scoring system, or 14-11 under the DBMM system. The Egyptian chariots and cavalry got the best of the fight against the hoplites and phalangites but struggled against the Companion cavalry. The numerous Egyptian archers contributed little to the battle in the strong winds, nor did the brand new Macedonian catapaults. Another meeting with a heap of Warhammer games, with everyone practicing for the forthcoming club Warhammer competition. Flames of War - Brett's Russian infantry successfully held the line against Kit's German grenadiers. WHFB - Rob and Aaron the Elder had a great 7000-point battle, with both sides being Orcs and Goblins. Russell's Tomb Kings (with something like fifteen to twenty chariots) beat Robert's Empire. Matt's Orcs and Goblins beat Dan's Vampire Counts. Dan's Vampire Counts then took on Robert's Empire army. Matt's Orcs and Goblins fought Russell's Tomb Kings. Aaron the Younger used Brettonians to massacre Neil's Lizardmen. Quite a busy day at the club today - lots of Warhammer games, and some discussion of getting the Warhammer competition underway. WHFB - Four games were played. Principles of War 15mm - Philip's 1859 Austrians took on Kendall's Prussians. Andrew and Matthew had another 15mm 19th Century game, Danes vs Austrians. Today the club was dominated by lots of Flames of War games, so there were lots of flaming tanks and cries of "stupid game..."
Shattered Lances - Philip (Normans in Sicily) v Brendan (Fatimids). The Normans took a defensive position in a valley. The opening moves of the Fatimids were rather lethargic, and the Norman right flank counter-attack drove them back. Regaining the initiative, the Fatimids pressured the centre and almost succeeded on the other flank before a final charge by Count Roger defeated them. DBR 15mm - In a battle somewhere in Persia, John's Turkomens narrowly defeated Grant's Persians. Flames of War Mid-war - Kendall successfully withdrew a US Para force from Brett's Russian infantry attack (won 6-1). Rob won 6-1 vs Garth in the cauldron. At NapCon, which was held in Upper Hutt recently, some of the players came up with the idea of forming a YahooGroup specifically for Napoleonic gamers in New Zealand. Thus Napoleonz was born - a YahooGroup for all Kiwis interested in playing the Napoleonic period, no matter what scale, what rules, or what type of game they like. Napoleonz is not a club as such, but rather a discussion group that crosses club boundaries to link players from throughout the country who enjoy gaming this colourful period. Already, after one week of operation, we have more than 30 members, and the discussion is brisk and lively. The group has also set up a database to record the most commonly played rules around the country. Flames of War - Rob (German) beat Brett (Russian Guard). DBMM 15mm - Kendall (Navarrese) and Andrew (Papal Italian) played two games. The honours were shared. Shattered Lances - Brendan and Grant played another game of SL. Brendan used an early Seljuq army (with Kakuyid ally), and Grant had Romanian Franks (with Trapezuntine ally). Honours were shared - both armies became disspirited in the same turn. We had our second annual DBR tournament this weekend. Danny retains the PoP Gun for another year having successfully defended his title with four straight wins. Jono won the prize for the best presented army, and he also got the Head Hunter's Award for destroying the most enemy generals. This year's tournament was based on the theme of armies of the English Civil Wars and the Thirty Years War. We agreed to run another Push of Pike next September, with the theme of Early European Armies (pre-1540). Pictures and etailed results of all the games are on the PoP page. Warhammer Fantasy Battle - The campaign concluded with a victory to Rob's forces of darkness. Shattered Lances 15mm - Brendan and John had a game with the new SL rules. John's Crusaders were attempting to defend a ridge line. DBMM 15mm - Brett (Alexandrian Imperial) beat Lee (Han Chinese). The Chinese had an all-cavalry army and they defeated the Macedonian cavalry. The Macedonian infantry and elephants still managed to do enough damage to defeat the Chinese army. It was a 9-1 win to Brett in the competition. DBR 15mm - Philip (Bishops' Wars English) and Andrew (Royalist) had a training game for Push of Pike, both using armies commanded by King Charles. 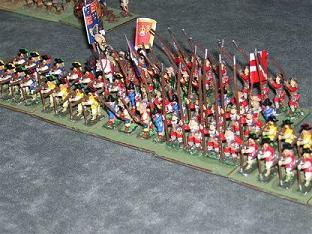 The Royalists had a large contingent of Cornish pikemen in the centre and a strong cavalry wing. The cavaliers made a dashing but futile attack on the opposing infantry, and were soon defeated. The rest of the Royalist infantry pushed forward with some success, but were at a disadvantage after the loss of the Cornish infantry general, and were eventually beaten. Flames of War - Kit and Kendall had a desert battle, using two of Kit's armies; Sikhs and Italians. The Italian colonial infantry force was defending entrenchments and won a decisive victory. Warhammer Fantasy Battle - Lots more battles and lots more carnage in the campaign games with by Aaron, Dan, Matt and Rob. DBMM 15mm - Philip (Mithridatic) beat Brett (Gallic) in a competition game. The invading Pontic army sent the scythed chariots in to lead the charge against the Gallic infantry, successfully followed up by a battle line of peltasts. On one flank Mithridates' Thracians cleared some Gauls out of the scrubby ground, and on the other flank his Armenian allies ran down the Gallic C-in-C. Meanwhile a large number of Gallic chariots and warbands were on a flank march. O� est Grouchy? A 9-1 win in competition terms or 20-5 in the new DBMM points system. DBR 15mm - John's Royalists beat Kendall's German Catholics. DBR 15mm - Kendall reformed his army and fielded German Protestants, but was beaten by Jono's Parliamentarians. We had a pretty full hall with lots of tables set up. Roland and Errol visited our club today, coming all the way from Whangarei. It was a good opportunity to present Roland with the ValleyCon medal for Best Painted Army that was won by the Indian army he had painted. Warhammer Fantasy Battle - There was a series of small battles played by Aaron, Dan, Matt and Rob, as part of a campaign. Most amusing was one battle where the entire table was a swamp. DBM 15mm - Al the Spartan and Errol the Viking had an ancients battle with a winning draw to the Spartans. The Viking C-in-C's command was broken, but the corresponding Spartan command was only 1.5 elements away from breaking itself. A large vineyard and orchard in the middle of the battlefield was contested by large numbers of Viking blades and Thracians who didn't live up to their Superior grading. DBM 25mm - Andrew's Han Chinese defeated Kendall's Hussites in a good old fashioned DBM3.0 game. The paper Hussite army has now been upgraded to cardboard bases, and there was even a glimpse of some loose figures nearby, perhaps even waiting to be painted. DBMM 25mm - Lee (Macedonians) beat Philip (Kushite Egyptians). The Macedonians began the battle under the leadership of Philip of Macedon, but, after an unfortunate encounter with an Egyptian chariot, ended the battle as Alexandrian Macedonians. Volley and Bayonet 15mm - Roland and Grant replayed the 1815 Battle of Quatre Bras. The game wasn't exactly as the hisorical battle, but quite close. A smaller table size meant reinforcements poured into the battlefield more rapidly, pressing the defenders hard. Flames of War - Kit (German) played Brett (Russian) in a scenario designed by Andrew, also on a table full of scenery designed and constructed by Andrew. The game used the street fighting rules from the Stalingrad book. The Shattered Lances rulebook has just been published. The rules cover the Crusades, as well as earlier conflicts in Central Asia, the Middle East and Europe. Specifically, they range from the early Arab conquests to the rise of the Ottomans and the Crusade of Nicopolis. The rulebook includes army lists for the First Crusade. SL is available from Outpost Wargaming Services listed on the Books section on their website. You might also like to join the Shattered Lances discussion list. Warhammer Fantasy Battle - Dan and Matt had a game, using each other's army - Empire and Undead. Both sides took heavy losses and the game was drawn. DBR 15mm - There was a campaign game between Philip's Spanish and the Tripolitanians played by John. A win to the defending Tripolitanians, who held out only 1 element from defeat. The Corsair galley fleet rowed up the coast, saw the rest of their command become demoralised, and then rowed back down. Meanwhile the Spanish commander entrusted his flank guard to some Italian cavalry, who were overwhelmed by the Moorish cavalry and camel riders. Exit the unfortunate Spanish commander, soon followed by the rest of his army. Flames of War - Rob was beaten by Andrew - a visitor from the City Guard club. It was a 4-3 win to the Germans, who were aided by RAF's poor target identification. Just a reminder, we have another meeting next Sunday, another of our '5th Sunday in the Month' meetings. Warhammer Fantasy Battle - Rob with Grimgor 'Ardboyz played Dan and his Vampire Counts. The 'Ardboyz smashed the Vampires in the first game, then in a rematch got a drawn game. DBMM 15mm - In an Ancients Competition game Jono moved to second place on the table, beating Brett down to third, with a 9-1 victory. Jono was using Ptolomaic and Brett had Later Muslim Indians. DBR 15mm - Kendall's new German Catholic Imperialist army (Grant's old army under new management) beat Philip's Parliamentarians. The Germans were able to repel the English attacks on both flanks, and also dominated the infantry firefight in the centre. We used 500 AP armies. And in the less competitive phase of the club meeting, Andrew and Kit got out that fine game from Milton Bradley, Skirmish: A Revolutionary War Game c.1975. A win to the British! Another one of Cheapass Games, Unexploded Cows, also made an appearance to entertain us in the evening.